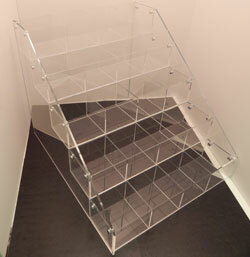 This is a tiered acrylic display rack that comes with two trays. This dispay is great for storing items in a compact space. Each of these trays can be customized to have a specific number of compartments to fit your display and storage needs. The tiered design makes these compartments easy to organize. The flame polished edges give this display a clean and professional finish. This acrylic multi bin display rack is comes with 5 tiered, custom trays. Each tray measures 16"w x 4"d x 3"h and is available with 1, 2, 3, 4, or 5 compartments.